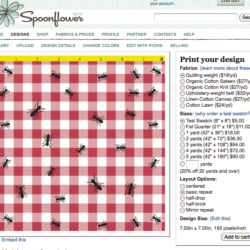 Spoonflower Free Swatch Day is live! [But the site is verrrry slow…] Please consider donating to @Heifer! Free Swatch Day is now live and will run for the next 24 hours (until noon tomorrow (EST, or GMT -4 :00). The site is very, very slow because of traffic, but if you're willing to wait a few hours to put in your order things should settle down. Keep in mind that if you have a swatch in your shopping cart from before the promotion went live, you will need to refresh the page to see the cost of the swatch calculate as $0.00. Please consider using the donation box at checkout to give the $5 you might have spent on a swatch to Heifer.org! what a generous offer you are making. i’ve donated to heifer.org before, and have so again, in response to your request. i hope you generate lots of donations. i just needed a kick start to get my plans for self designed fabric back on track, so i will be interested to see the swatch when it arrives. Thank you! I hope we generate lots of donations for Heifer, too. About to check the stats… will post an update.